Alfie Kohn, one of the smartest voices in the education reform discussion, has an interesting article about new research into the value of homework, one that includes a reminder of the important of reading studies carefully “rather than relying on summaries by journalists or even by the researchers themselves”. Kohn, who literally wrote the book on the subject, the wonderful The Homework Myth: Why Our Kids Get Too Much of a Bad Thing, starts by noting the significant lack of support for the instructional value of homework found in previous studies. First, no research has ever found a benefit to assigning homework (of any kind or in any amount) in elementary school. Second, even at the high school level, the research supporting homework hasn’t been particularly persuasive. Third, when homework is related to test scores, the connection tends to be strongest — or, actually, least tenuous — with math. This latest study focuses on math and science homework in high school, an area that Kohn says is one “where you’d be most likely to find a positive effect if one was there to be found”. Beyond the value of homework, or the lack thereof, Kohn’s discussion of the research process itself, and especially how the researchers “reframe these results to minimize the stunning implications”, is well worth your time to read the whole article, footnotes and all. Florida Senator Marco Rubio, someone who is supposed to be a front runner for the Republican presidential nomination in 2016*, was asked in an interview “How old do you think the Earth is?”. There may be “multiple theories” on the age and origins of the universe, but the only ones that should be taught in science classes are those backed byÂ evidence, not myths and legends. * The fact than anyone is making that assessment two weeks after the previous election is very depressing. In the op-ed section of the Post this morning, Alfie Kohn, one of the smartest voices in the debate about American education, challenges the myth that today’s parents coddle their kids more than ever, and as a result, those children are the most undisciplined generation in history. It must be true since it says so in dozens of books and articles on the subject. Except, as Kohn notes, there are just two problems with those “what everyone knows” facts. Social observers have been saying exactly the same thing about each generation of kids for more than a century. And there is almost no research to support any of these claims, with what has been done largely based on questionable methodology. There’s no evidence, then, that today’s parents are more permissive than parents of yesteryear, or that today’s young people are more narcissistic. But even if there were, no one has come close to showing that one causes the other. Neither logic nor evidence seems to support the widely accepted charge that we’re too easy on our children. Yet that assumption continues to find favor across the political spectrum. It seems that we’ve finally found something to bring the left and the right together: an unsubstantiated knock on parents, an unflattering view of kids and a dubious belief that the two are connected. When it comes to the debate over issues related to American education, it’s not surprising that both often go missing. The regular Five Myths column from the Sunday opinion section of the Post addresses some statements of “truth” on the topic of merit pay popular with politicians and education “experts”. 2. Teachers unions are the biggest barrier to merit pay. – Yes and no. But the merit pay experiments of the 1980s also failed because they were, at bottom, capricious. This is far from a comprehensive assessment of the misinformation thrown around in the debates over merit pay but it’s worth a few minutes of your time. 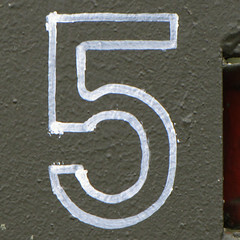 Image: number 5 by Leo Reynolds, used under a Creative Commons license.